After coming in from the covered piazza, you enter a foyer space with a coat closet and an open stairwell. To the left of the front door there is a study or guest suite with a walk–in closet and a view through tall windows to the front of the house, and full bath that doubles as a guest powder room. If you turn right upon entering the house, you enter an open family room with a large central fireplace and optional built–ins on either side of it. This gathering area is open to both the kitchen and the dining room. The kitchen features a center island for additional workspace, and a raised eating or serving bar that divides the kitchen from the dining room. Off the dining room there is a small room for a home office, and two doors that open onto a private outdoor patio space. The upper loft area is naturally lit from the windows in the stairwell and the glazed door that opens onto the upper piazza. The master suite has a pair of doors that open on to the upper piazza, and the master bath features a private toilet room, both a tub and a separate shower, two sinks, and a spacious walk–in closet. There's a conveniently located laundry room, a linen closet, a full bath, and two additional bedrooms with walk–in closets located on this floor. 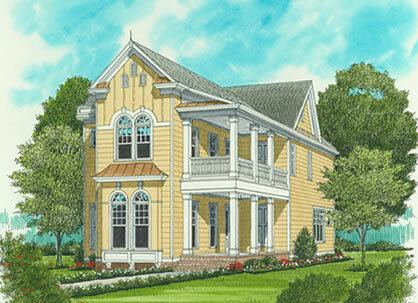 This house plan also comes with drawings for a detached two–car garage. This home is full of southern charm, and at only 25' wide, it's ideal for those with narrow lots. The covered entry piazza and upper piazza are supported by decorative box columns, providing the home with additional outdoor living spaces as well as attractive design elements.